Have you ever wondered the Secrets that Online Millionaires (Internet Marketers) use to succeed in Online Business & yet nobody reveals those underground Secrets? 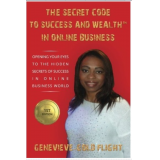 Genevieve Flight in her Ebook "The Secret Code To Success and Wealth In Online Business" has revealed those Secrets and now is your time to know exactly what they have not been revealing to you. Many business owners including individuals, small businesses and corporate organisations understand the need to have an online business in order to attract more customers and thrive in the ever changing Online Business World. However, some individuals and established companies still find it difficult to keep up with the pace of change seen in today's online business world despite the fact that most of these changes are within the reach of both experienced and inexperienced Online Business Owners. "The Secret Code To Success And Wealth In Online Business" contains eleven chapters which has been strategically written in order to assist both individuals, small business owners and Companies that have either embraced or are yet to embrace the online business market as well as the everyday changes that come with it. This book is packed full with numerous strategies to help you identify great niches within existing needs in the market, integration of social media, how to build high level converting traffic, how to brand your business effectively, how to optimise your search engine, knowing great useful websites for different business needs, using the latest tools and strategies to focus on improving your business, using Facebook for business, the 10 steps you need to continue to be a successful online business entrepreneur etc. You will also find three free bonus gifts inside including 200 free Business Tools inside the book.